It is an honor to be able to support children and families during their most vulnerable times. There is nothing more rewarding than helping families navigate challenging life events while seeing strengths, resilience, and positive changes emerge from their experience." Following in her mother’s footsteps felt natural as Chelsea trained to become a clinical social worker. From a very young age, her mom instilled in her the importance of advocating for those who were not being heard or given a voice. She also saw the profound difference her mother made in other people’s lives, which inspired her to take on a similar role helping families. 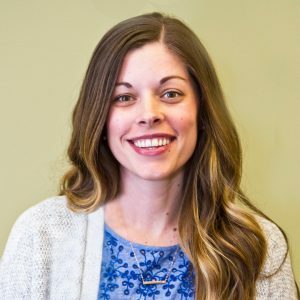 Initially Chelsea worked with parents struggling with substance use who were working to regain custody of their children and rebuild their lives. She later transitioned to supporting children with cancer through the end of life. Her focus during that time was helping patients and families cope with diagnosis, crisis, grief, and loss. Although the work was emotionally trying, she learned to appreciate kids’ amazing resilience present even during the biggest battle of their lives. Chelsea knows it takes a great deal of strength and courage to ask for help, and always feels honored when families are open to her support during vulnerable times. Helping families learn to cope with significant life stress, watching them grow, and come out stronger on the other side is the best reward! Even after all this time, she’s still impressed by people’s ability to overcome any struggle. Chelsea’s happy place is wherever she’s with family. You will often find the Kayes on a court or field thanks to Chelsea’s sports-loving children and husband. Other family favorites include fun adventures to the coast, camping, and exploring the Northwest. To get her blood flowing, Chelsea loves yoga and running, especially mud runs! She also likes to attempt new recipes and is always up for a messy craft project with her kids. "I went to Metropolitan Pediatrics for the first time yesterday and had the pleasure of working with the NP Sherrie Sweeney and the Social Worker Chelsea Kaye who were both very attentive and addressed my concerns with my daughter with respect and professional compassion. I left the office knowing I had come to the right place and we would be getting the help that we desperately needed. I highly recommend this office and especially Sherrie Sweeney and her colleague Chelsea Kaye."